Joanna Pietrocola graduated from Alliance High School in 1948. A retired vice president of the trust department at United National Bank & Trust Co., she passed away in 1999. While her vocation was a long successful career in banking, her avocation was community service which she pursued enthusiastically. Joanna volunteered many years of service and held leadership positions, including campaign chairperson of the Alliance United Way, past presidencies of Quota Club, the Women’s Division of the Alliance Area Chamber of Commerce and the Alliance Women’s Club. She was a member of the Mount Union College Women’s Club and a past president of Beta Sigma Phi Sorority, a social, cultural and service organization. She served as a director of the Alliance Chapter of the American Red Cross and was a life member of the Alliance Historical Society and the Mabel Hartzell Historic Home. Joanna’s long and dedicated service to the community did not go unrecognized. In 1997 she was the recipient of the Book of Golden Deeds Award from the Alliance Exchange Club and in 1989 she was named an Alliance High School Distinguished Alumni. Additional honors include the 1993 YWCA Woman of the Year and in 1995 the Athena Award. In 2000, the Joanna Pietrocola Memorial Scholarship was established using memorial contributions made at the time of her death. In memory of Joanna’s many years of volunteer service to the community, the scholarship selection criteria are established to include school and community involvement and leadership and academic achievement. Recipients are chosen annually by a committee established by the Pietrocola family. 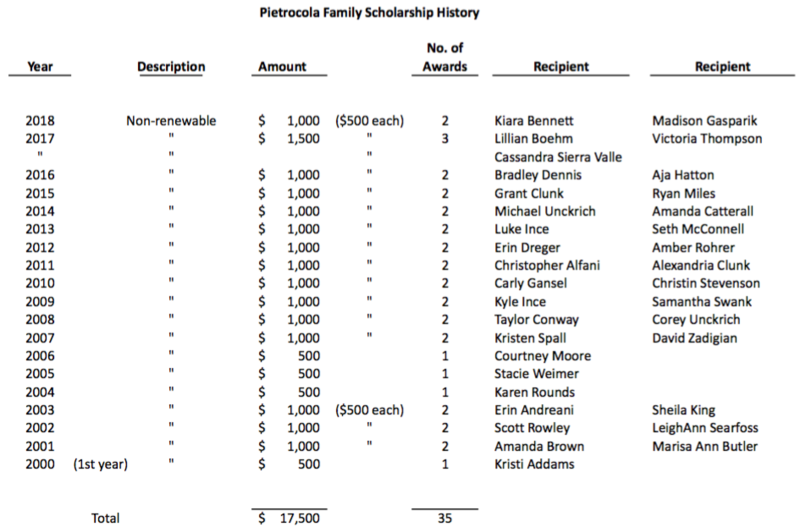 ​ In 2017, this scholarship was renamed the Pietrocola Family Memorial Scholarship. The death of Nick Pietrocola ‘54 on March 4, 2017, instituted this change, as donations in memory of Nick significantly increased the scholarship fund. During his career Nick worked primarily for the Henschen Motor Company, retiring as Sales Manager. After retirement, Nick shifted ‘one block south’ to be a greeter at Sharer-Stirling-Skivolocke Funeral Home. Nick was the ‘man about town’ for over sixty years. He belonged to everything and knew everyone. Nick’s affiliations included past presidencies’ in the Alliance Kiwanis Club, Carnation Festival Board and the former AHS Athletic Booster Club. He was an active life-long member serving as an officer of the Christopher Columbus Society, an active life-long member serving as Grand Knight and Faithful Navigator of the Alliance Knights of Columbus and a life-long member of the BPO Elks Lodge #467. Nick was a former member of the Alliance School Board, an active member of Regina Coeli Church, the Aviator Sports Boosters and the Alliance Area Senior Center where he was a member of the board of trustees. He was also a member of the Friends of Rodman Library, the Castle Crusaders and the Carnation Auto Classic Car Club. Nick is survived by his wife of sixty years, Josephine Rich Pietrocola ‘54, daughter Stephanie ’83 (Craig) Unckrich and two grandsons, Corey Unckrich ’08 and Michael Unckrich ’14.